Collections support different options that allow you to tailor the alert details that appear on an OpenEdge Management collections page. From the options available on the Customize Viewlet page, you can modify what appears in the Resource with alerts viewlet that appears on a main collections page. 3. Select a maximum of three options in the Fields to display section. By default, all three options are selected. To deselect any option, click the checkmark. 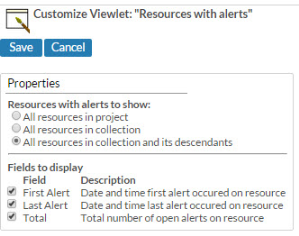 Any changes you make to Resources with alerts to show and Fields to display settings appear in the Resources with alerts viewlet the next time you view the collections page.